Like the burger, pastrami cuts across a number of class lines and within its genus contains a multitude of high and lowbrow options. Different kinds of pastrami for different kinds of people. Johnnie's Pastrami and The Hat are both, in their own way, Southern California fast food essentials, one a West L.A. classic, the other a San Gabriel Valley staple. They specialize in the type of pastrami sandwiches that overflow from French rolls with mountainous heaps of thinly shaved meat ideally accompanied by an equally heaping mound of chili cheese fries. At Johnnie's, the pastrami is more peppery and more intense but also a tad bit more chewy than at The Hat. It comes on a bun shiny with its own grease, as your hands will be after a few bites. You'll need a lot of napkins, but ultimately, it's a deeply satisfying sandwich. At The Hat, the pastrami sandwich is technically a pastrami dip, but it comes with a Styrofoam cup of brown liquid so sad, watery and bland, it's barely recognizable as jus. The quality of the meat can vary from Hat to Hat, sometimes even at the same Hat. (We prefer the original location at the corner of Valley Boulevard in Alhambra.) 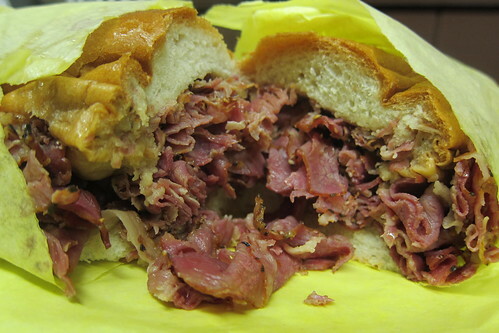 The pastrami is always thinly sliced, the broad ribbons of fatty meat curling in on themselves. On a good day, the it's tender and the flavor mild. If you're looking for lean meat and moderation, well... you may as well stop reading right now. Everything at The Hat is super sized, especially the chili cheese fries. There's no "small" or "large" at The Hat. For less than $5, the chili cheese fries come in only one option, gargantuan enough to fill a football player's helmet. Size doesn't always matter. 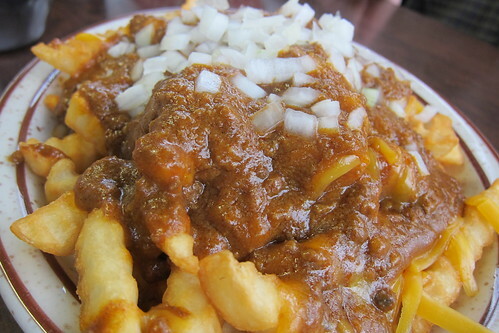 Like the pastrami, the chili cheese fries at Johnnie's are better. It comes down to the chili, which has a more distinct and robust flavor (also in evidence on their gringo taco). 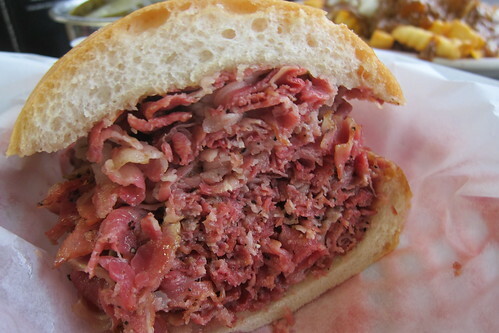 For the pastrami, we prefer The Hat because of the tenderness of the meat. For the chili fries, Johnnie's wins, hands down.